Every woman wants to be healthy and have a strong and beautiful body. However, if you want a body like this, you should make some effort. Healthy diet and regular physical exercises will help you to achieve desirable results. Yes, proper diet is vital for our health and beauty. You should quit junk food and start eating healthy and nutritious foods that will help you to gain muscle mass and get rid of excess weight. However, physical exercises are also highly important. There are two main kinds of exercises. Cardiovascular workout helps to train your heart, strengthen your body, and helps to melt excess fat. Strength exercises help to tone your muscles and gain muscle mass. That’s why it is important to combine healthy diet and workouts. However, today, most of women work the whole day and are busy even at home. They have time to cook healthy food, but they don’t have time to attend a gym regularly. That’s why it’s rather hard for them to lead a healthy lifestyle. However, there is nothing impossible. Today, we have decided to help you a little. You should know that there are exercises that you can perform even at the office. You can target different muscle group without even standing up. 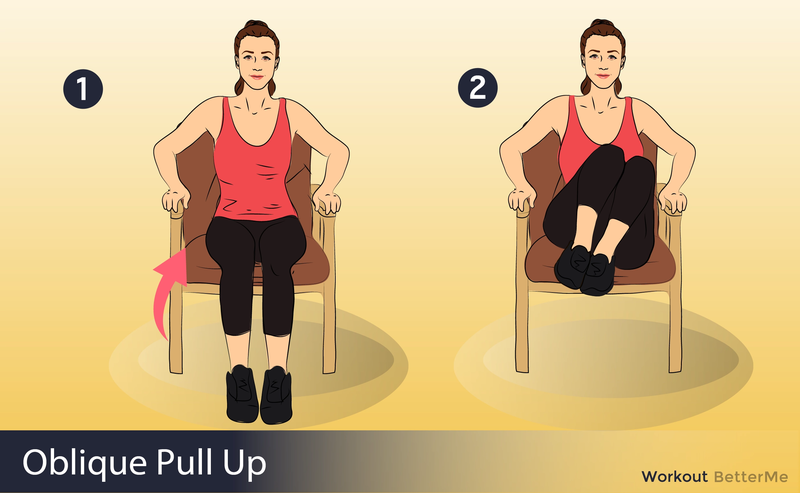 Below you’ll find a list of 4 inner thigh moves to do while sitting in a chair. They are really easy and won’t take much time and effort. You can perform them even sitting in your office chair. By performing them regularly you’ll achieve desirable results very soon. So try these moves and you won’t regret it!